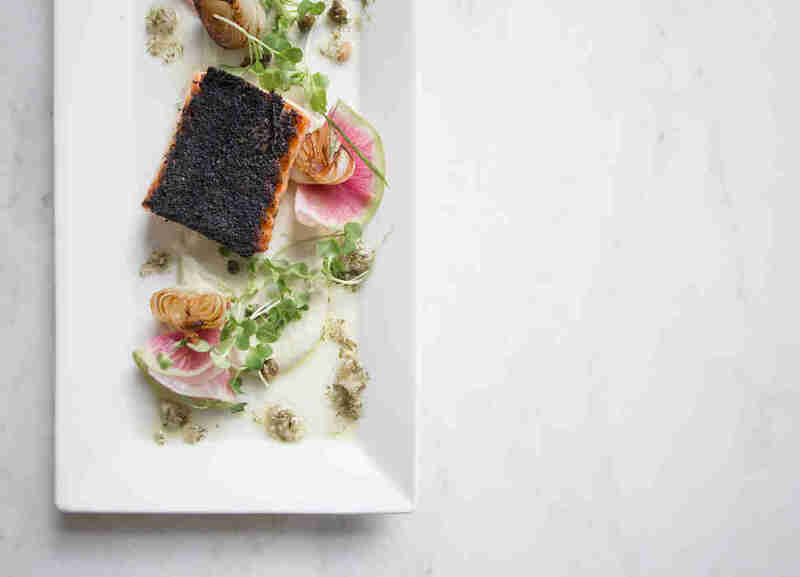 T he last few years have marked a shift for the Twin Cities dining scene. Several cornerstones of our culinary heritage have closed, among them La Belle Vie, Vincent’s, Piccolo, Saffron, and Haute Dish... but let's focus on the future. A host of ambitious newcomers have created outstanding food inspired by cuisines spanning the world, and it's all at your fingertips. Understated, elegant Japanese food? Check. Perfectly executed Southern barbecue, exploding with flavor? Check. Better happy hour deals and multi-course tasting menus? Check. Here are the best restaurants to grace Minneapolis and St. Paul in 2017, and here's hoping they stay forever. Minneapolis master chef Doug Flicker may have closed his beloved restaurant Piccolo last year, but he's back with this gorgeous new restaurant at the famed Walker Art Museum. The recently revitalized space overlooks the stunning new sculpture garden and features an expanded patio that is as stylish as the world-class museum it adjoins. 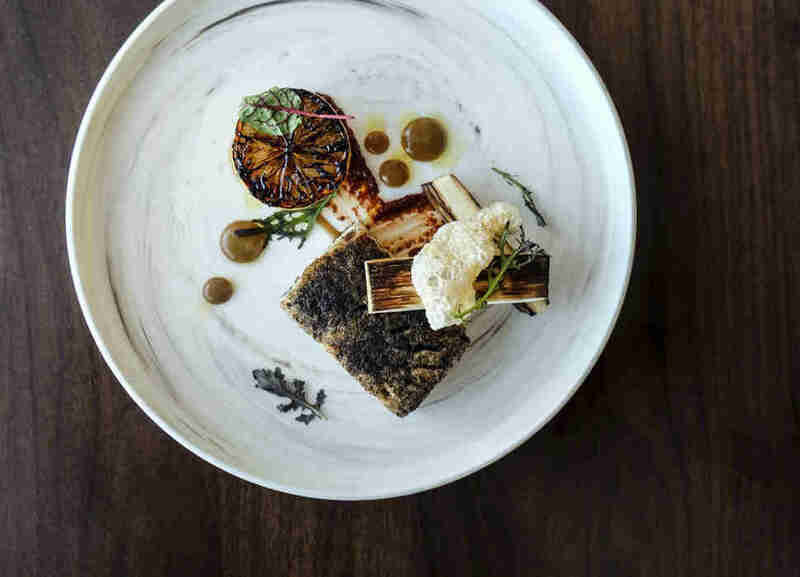 Flicker carries that stylishness over to his impeccably arranged, Instagram-worthy small plates, and Esker Grove’s menu has everything from breakfast boudin noir to chestnut soup, all made by sourcing impeccable ingredients and letting them sing with few accoutrements. Whether it’s an artfully arranged herb and seaweed salad, a coconut and squid ink-bathed tuna crudo, or a dashi-tinged pumpkin, you’re guaranteed to receive it impeccably cooked at peak freshness. No wonder Anthony Bourdain loves this Flicker's work. Mercy, the latest iteration of Le Méridien Hotel's mercurial restaurant space, is one of the best places to pick for groups. In addition to twice-daily happy hours and incredible food, Mercy has not one but two liquor-strong punch bowl options -- perfect for group dates and long chats. It’s easy to stay put a while since the old space feels fresh again with the addition of handsome dark wood finishes, warm globe lighting, and a windows that have been swathed in plants. Food-wise, do not skip the crab-stuffed grilled cheese on brioche with a side of red pepper soup for dipping; it's just as luxurious as it sounds. 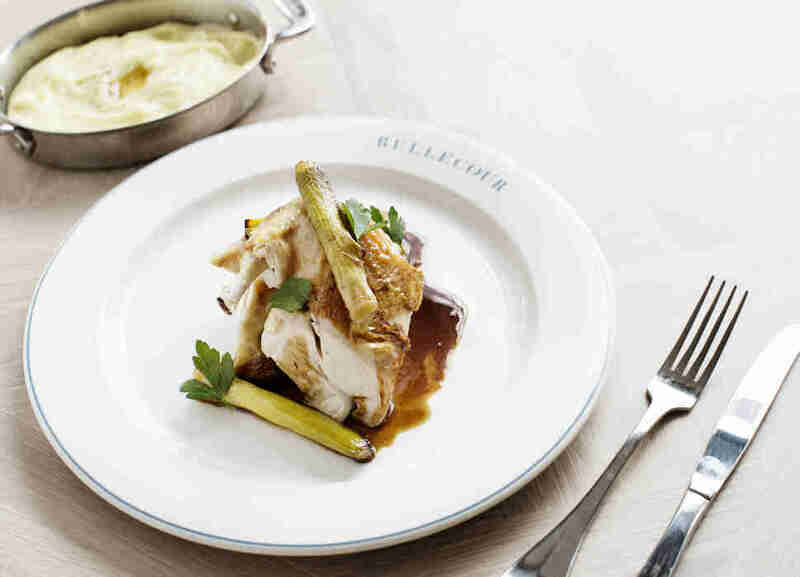 Order the beer can chicken and you’ll get a boozy chaser with your entrée, free of charge. And the happy hours are no slouch either, featuring discounts on a range of seafood items and an appealing list of extravagant cocktails. Not many places in Minneapolis or anywhere else can claim an origin story like Hi-Lo's. It's a beautifully restored, art deco 1957 Fodero Diner that was shipped piece by piece from a field in Gibsonia, Pennsylvania, and it's become an instant hit with the Minneapolis foodie community. All the standard diner fare can be found on its menu, but not without a twist to elevate it from ho-hum to, well, high-low. Minnesota-sourced ingredients like crawfish, tart apples, cheese curds. and juniper inflect the menu with a truly local flavor. Hi-Lo serves comfort food in abundance alongside healthy options to suit every dietary need, and even the pickiest eaters should have no problem finding something they like. The time-capsule facility is parked only a few blocks away from the gorgeous Mississippi river, and any trip to Hi-Lo requires that you accompany your meal with a short stroll by the water. More than most other restaurants that opened this year, Kado no Mise is fancy and particularly focused on its elegant, minimalist aesthetic. Every detail in this multi-story gem is considered -- down to the delicately patterned plates -- and you are sure to leave with at least a few Instagram-worthy snapshots by the end of your meal. It helps that Kado no Mise is a truly great traditional Japanese restaurant. Along with simple and impeccably crafted Japanese staples from agedashi tofu to seasonal miso soup, this place has the freshest nigiri on this side of Lake Superior. Like the décor, the food's flavors feel traditionally Japanese: clean, understated, and extremely fresh. The locally based Tattersall Distillery anchors the cocktail menu with intriguing mixers like grapefruit crema and lemongrass, but Kado no Mise also carries an extensive list of sakes or, better yet, Japanese whiskys. Pro tip: It’s expensive, but spring for the traditional omakase tasting menu. You won't regret it. Bardo serves modern New American food in a calm, blue and white dining room, and its name "bardo" is defined as "the state of the soul between death and rebirth" -- which on the outside seems to be as serene and meditative a restaurant concept as ever existed. Just wait until you taste the food. It's clear chef Remy Pettus has infused time, care, and personal attention to every aspect of his dining experience -- from hand-made sauces to herbed dusts and powders that finish every dish. Everything is taken just a little bit further than it needs to be into an over-the-top success. When is the last time you had salted cucumbers and yogurt in your cocktails? Or a rich rye whiskey blended with, among other things, peaches, thyme, and egg whites? Why stick with scalloped potatoes when you can make an aligot potato with fresh chevre? It all works marvelously, of course; Bardo's food is staggeringly good. And when the weather warms up again, the restaurant boasts one of the most luxurious off-street patio spaces in the Twin Cities. Thank God Delicata came to St. Paul. The space is filled with warm woods, cheery hues, and bright lights, practically guaranteeing you will stay for hours. The friendly aura extends to the staff and servers, all of whom are ready to ply you with pizza and a wink and a smile. Delicata's menu is anchored with a thoughtful mélange of pizzas, with classics like pepperoni nestled alongside more exotic offerings like shrimp and pesto; artichoke and feta; and delicata squash and prosciutto pizzas. If you are one of the many who prefer pizza in the morning, you’re in luck here too. Delicata serves a slam-dunk brunch that mercifully skips old faithfuls like eggs Benedict for more creative options like a breakfast pizza smothered in either maple butter, bacon, fontina, agrodolce, and apples; or a Southwestern take with eggs, roasted chili sauce, chicken, onions, queso, sour cream and cilantro. Cap off your day with a trip to the Como Zoo and a scoop of Delicata's hand-made gelato. More isn’t always better, of course. When you need somewhere to get filling, straightforward dishes executed with panache and passion while wearing your comfiest jeans-and-sweater combo, Gray Duck is the spot. Gray Duck’s approachable pricing fills a long-vacant void in downtown St. Paul’s dining options: an appealing medium between overpriced fine dining and dirty dive bars. 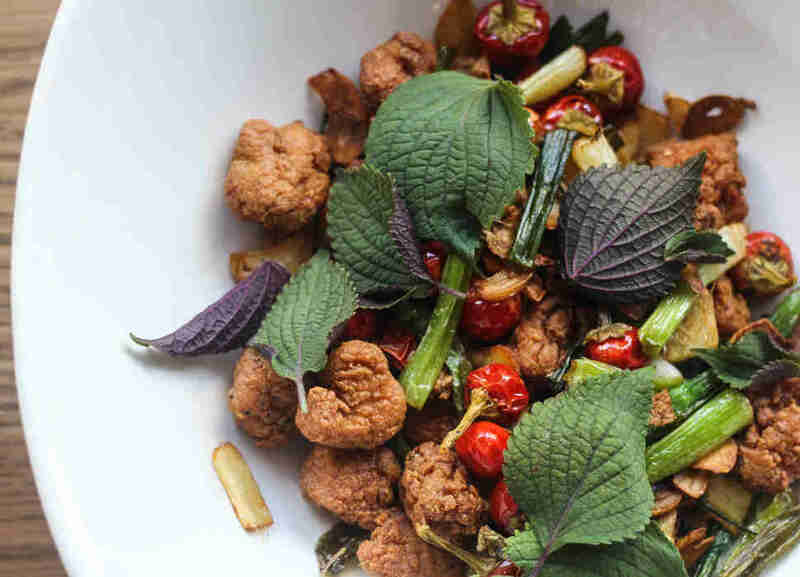 It only gets better during happy hour, when diners can find deals on noshes like East African samosas, tamarind chili wings, and Calabrian chili-laced chong qing chicken. If you stay through dinner, you can savor creative dishes like duck schnitzel; a casserole filled with ground brisket, strozzapreti pasta, and a plethora of cheeses; or fresh carved meats that rival those of Fogo de Chão. That knack for fusion and creativity applies to the tightly curated cocktail menu as well, which includes oddities like paprika-laced mezcal alongside rum and salted caramel options. Minnesota Wild fans in particular will appreciate Gray Duck Tavern’s free ride program, guaranteeing safe passage from their doors to the game. For the Twin Cities’ most thoughtful whiskey experience, look no further than Dalton & Wade Whiskey Common. Diners can find classy takes on down-home soul food like smoked bologna sandwiches, pan-fried lake trout, pimento cheese Texas toast, and that beloved foundation of Minnesota winter meals, a bourbon mushroom cream-infused hot dish. If you’re feeling extra, dive into a perfect barbecue spread of brisket and hickory-smoked pork shoulder with a side of rye biscuits, sorghum butter, corn pudding, and fried apples. 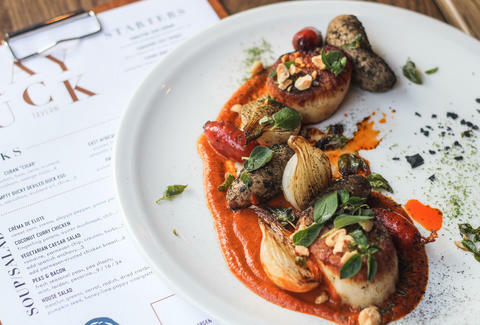 The restaurant is lined with cozy booths tucked right next to floor-to-ceiling windows that provide a bright view of Minneapolis’ trendy North Loop. All of this -- and the very Southern chandelier made of leather belts -- makes Dalton & Wade feel as comfy as a well-worn flannel shirt, and one of the best new spots to toss back a few. Becki Iverson is an overstimulated millennial with multifarious passions she somehow finds time to catalog at her blog, Compendium. Follow her on Instagram @beckiiverson for snapshots of how her brain operates, or Facebook for a shortcut to her long-form musings.